A good friend of mine is back in New Orleans after a four-year absence and wanted to spend his week here dining at restaurants a college budget didn’t really fit. He dined out every day (often twice), and this meal at Coquette was his clear favorite. We first sat down and our server asked us if we wanted cocktails. NOLA is famous for its southern hospitality, particularly at nice restaurants. This meal in its totality had some of the best service I’ve had: Friendly, informative, and attentive while simultaneously not over-eager, condescending, nor intrusive. Bread and our cocktails (the daily special, an Orange and Ginger Punch) came out first. 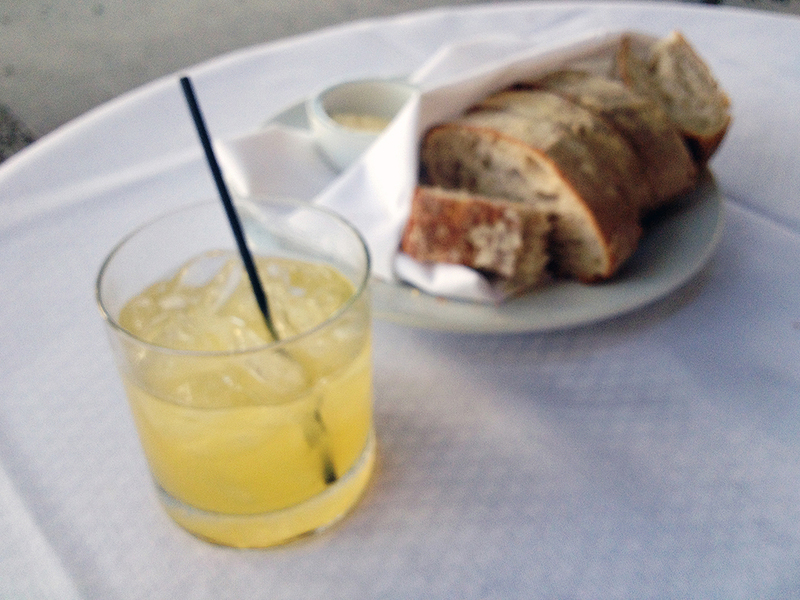 I often say you can tell a lot about a restaurant by its bread… and its butter too I suppose. Something so simple can really set the tone for a meal. The punch was great, the flavor of the vodka muted with the sweetness of the orange and the slightly spicy, almost peppery flavor of the ginger. Were we not headed for a night of beer-drinking after and doing wine pairings with dinner, I would’ve drank several glasses of it. Man cannot live on bread alone. So he invented butter and alcohol. To start, a salad of Pickled Baby Beets. I have this theory that people who don’t like beets have only had them out of a can. These were delicious, red and golden in color. The burrata (mozzarella’s creamier cousin) and little slices of duck ham added some richness. Fava beans for some protein and green. (Anyone who’s cooked fava beans knows what an ordeal they can be to prepare, and there were quite a few of them on this plate.) The sweetness of some aged (rather than just reduced) balsamic vinegar just enhanced every other component on the plate. Next, a perfectly cooked filet of Alaskan Halibut, skinless but crispy on the outside and just-cooked on the inside. Crispy-tender English peas, still bright green, around a Carolina Gold “risotto” sitting in a spring onion broth rounded out the dish. Risotto is in quotation marks because it wasn’t traditional risotto rice but a long-grain prepared risotto-style. The friend I dined with expressed slight disappointment that it wasn’t traditional risotto, so I probably should’ve warned him that Carolina Gold on the menu implied a different grain. He finished everything on his plate though, so clearly he wasn’t that disappointed. Although another restaurant in town is more famous for Cochon De Lait, I think Coquette’s take on the dish is just as good. Maybe even better. Anyway, a well-sized portion of fork-tender pork sits on top of sweet potato puree, surrounded by caramelized brussel sprouts. On a personal note, I didn’t grow up eating brussel sprouts. My parents never cooked them, so I was introduced to them as an adult in fine dining situations. Consequently, I’ve never disliked them. These are among the best. I’ve seen an anti-vegetarian or two gasp at how good these are. 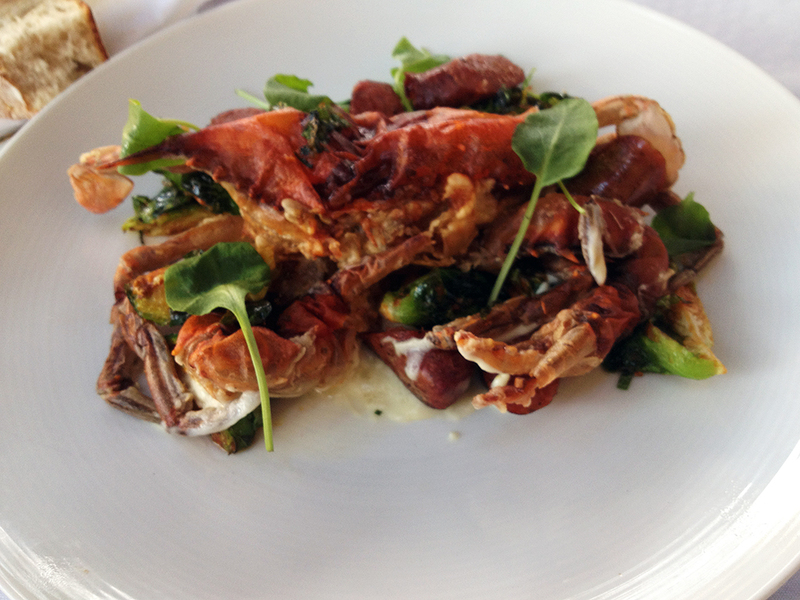 We got an extra entree to split: Softshell Crab. This dish emphasizes Chef Michael Stoltzfus’s Maryland roots. Unlike the majority of softshell crabs in town, this one is not battered like fried chicken. It’s just a deep-fried crab, awesomely light except for the oil it was fried in and the crab’s own fat. Kohlrabi puree and Merguez sausage add some contrast of creaminess and spiciness. More of those wonderful caramelized brussel sprouts add sweet and bitter. Fresh watercress and fried mint (yes, fried mint) freshen up the dish. Fantastic. We dined at a table on the sidewalk, so I didn’t feel bad using my phone’s camera. Coquette got a new pastry chef last year. Chef Zak Miller, like many other great pastry chefs (in town and elsewhere), takes classic desserts and remixes their flavors and textures playfully… creating dishes that give diners a comforting familiarity and the fun of trying to figure out why adish they’ve never had before reminds them of something else. Unlike my mother, I am not a donut lover. But the Old Fashioned Donut we each had for dessert was quite good. Maybe it was the portion being not too huge and not too heavy. Maybe it was the sweet bursts of the huckleberries around it, or the crumbles of oatmeal crunch, or the melting scoop of sour cream iced cream on top. I probably wouldn’t have picked this from a dessert menu, so I’m glad it was part of the tasting and I got to try it. We split an extra entree so why not an extra dessert as well? And “Strawberries & Cream” is classic, but I’ve never had it quite like this. A “strawberry roll-up” (which looked like a fruit roll-up but was more like a paper thin hard candy) piped full of whipped cream, flanked by strawberry sorbet, macerated strawberries, and strawberry foam. That sounds heavier than it was. The only part of the dish remotely heavy was the cream, which obviously had been whipped full of air. Any strawberry lover — I’m assuming these were local Ponchatoula, at the height of their season — would enjoy this celebration of the fruit. The only other components of this dish were a little mint and obviously some sugar. This was a meal of clean, bright flavors and pleasantly varied textures. Some dishes you may see coming to the table and at first think “Wow, too much going on” but realize all the ingredients come together beautifully once you have a taste. One of the reasons I’m continuously impressed by Coquette is the balance of each dish. Between flavors. Between textures. Between cuisines and styles of cooking. It’s always a balance done gracefully and subtly. This entry was posted in Food, Where'd ya eat? and tagged balsamic, beet, berries, booze, carbs, cheese, crab, duck, fish, ice cream, seafood, soft-shell, spicy, sweet potato. Bookmark the permalink.